The forecast for subfreezing overnight temperatures in Eugene is nature’s fair warning that winter is here. Just enough time remains to review how to dress and walk for the best chance of staying safe, warm and upright. Spoiler: A trick is to walk like a duck. 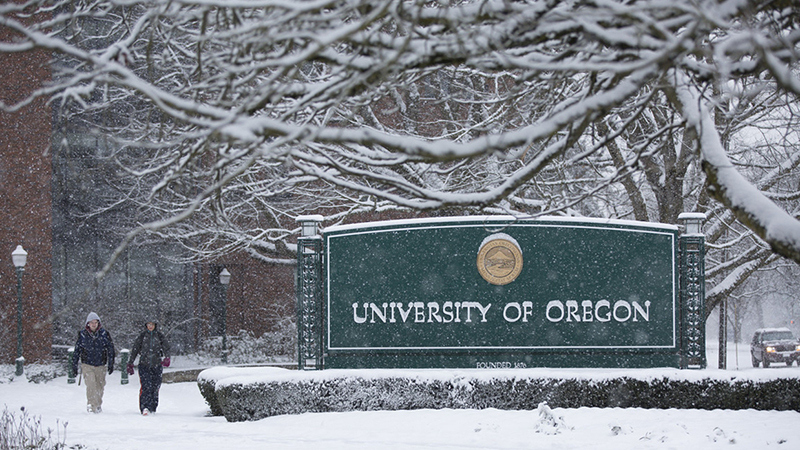 In the notoriously icy winter of 2016-17, the UO received reports of 14 slip-and-falls from around campus, many involving fractures. And that’s just what was reported; many more go undocumented, but all of them can hurt or lead to serious injury or missed work. Slips, trips and falls are the leading cause of injury in Oregon, both in and out of the workplace. Changing how you walk on slippery surfaces can mean the difference between making it home safely and taking an unexpected trip to the hospital. Slow down and take short steps: think waddling. Walk flat-footed, with toes pointed slightly to the sides. Keep your wings — or hands —by your side and not in pockets; hands in pockets can’t help break your fall. In documented falls, a common factor is people taking long steps or even jumping to avoid a puddle or a patch of snow or ice. That leaves them out of balance and causes a slip and fall. Sturdy shoes or boots with a tread that grabs are preferred in winter. Sandals, shoes with slick bottoms, or high heels can pose a safety risk in winter. A hat or hood not only keeps the head warm and dry but also can protect from icy branches or falling bits of ice. A good outer coat — either thick or with layers underneath — also does double-duty keeping the body warm and dry while providing padding against abrasion in a fall. Gloves protect from cold and also offer padding in case of a fall. If, despite all the right precautions, you do fall, remember to report any injuries, no matter how serious and regardless of medical treatment, so the UO can take proper action.